(CNSNews.com) - During the 90 full months President Barack Obama has completed serving in the White House—February 2009 through July 2016--the U.S. Treasury collected approximately $19,966,110,000,000 in tax revenues (in non-inflation-adjusted dollars), according to the Monthly Treasury Statements. During those same 90 months, the federal debt rose from $10,632,005,246,736.97 to $19,427,694,579,786.64—an increase of $8,795,689,333,049.67. In July, according to the Monthly Treasury Statement released today, the federal government took in $209,998,000,000 in taxes and spent $322,813,000,000—running a one-month deficit of $112,815,000,000. So far in fiscal 2016, according the Treasury statement, the federal government has collected approximately $2,678,824,000,000 in taxes and spent approximately $3,192,487,000,000—running a deficit of $513,662,000,000 for the first ten months of the fiscal year. Given that the Bureau of Labor Statistics has reported that there were 151,517,000 people employed in the United States in July, the $19,966,110,000,000 in taxes the Treasury has collected during Obama’s first 90 full months in office equals approximately $131,775 per worker. The $8,795,689,333,049.67 in additional debt the federal government incurred during Obama’s first 90 full months in office equals approximately $58,051 per worker. The Treasury only needs to pull in another $33.89 billion in taxes to reach the $20 trillion mark for Obama’s presidency. (The $19,966,110,000,000 the Treasury pulled in during the first 90 full months of Obama’s presidency equals approximately $221,845,666,666.67 per month). During the first 90 full months George W. Bush was president (February 2001 through July 2008), according to the Monthly Treasury Statements, the Treasury collected approximately $16,048,182,000,000 in taxes. 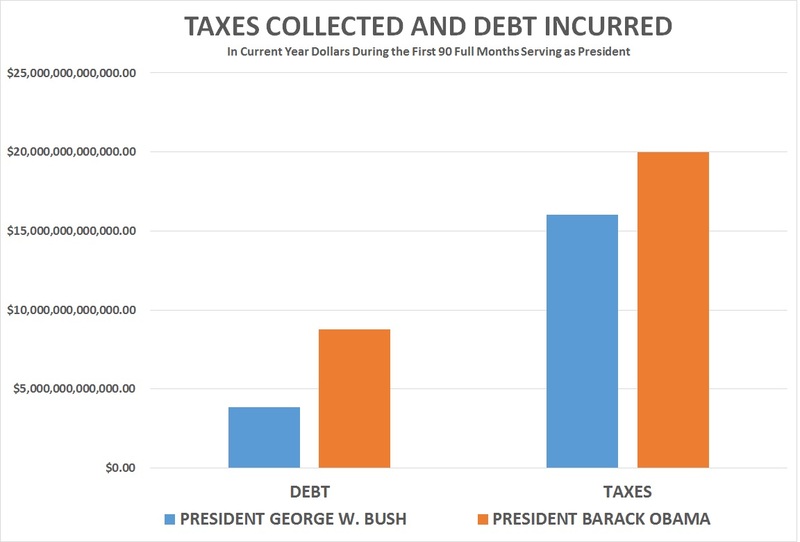 The $16,048,182,000,000 in taxes the Treasury collected during Bush’s first 90 full months in office equaled approximately $110,273 for each of the 145,532,000 persons who had a job as of July 2008. During the first 90 full months of George W. Bush’s presidency, the debt rose from $5,716,070,587,057.36 to $9,585,479,639,200.33—an increase of $3,869,409,052,142.97. That equaled approximately $26,588 in added debt for each of the 145,532,000 persons who had a job as July 2008.